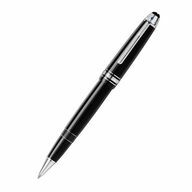 Each Montblanc UNICEF Meisterstuck sold raises the amount donated to UNICEF. The Montblanc UNICEF Meisterstuck features the first character learnt by children around the world. The design is inspired by the Rosetta stone, an ancient artifact used to decipher Egyptian hieroglyphics, created in Egypt in 196 BC.